When picking a fencing material, you are going to want to balance the cost of it with the relative durability and security of the material. Whether you are looking to install a residential fence or a commercial one, chain link fencing is always a great choice. Though it may not be as visually appealing as other fencing materials, chain link is still a very popular choice when it comes to fence installation. It is durable, easily maintained, and most importantly, cost effective. Keep reading to find out all of the different benefits of chain link fencing. 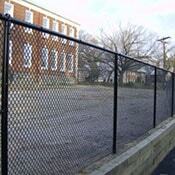 There is no doubt about it- chain link fencing is super durable and also a great security feature. Chain link material is made of woven, interlocking coated steel wires. They are vent vertically in order to form a vertical pattern and then joined with other strands to create a diamond grid. The material is attached to steel posts that are then embedded into the ground. Because of the nature of its construction, chain link material is a great option when looking for a good security fence. They can be used to enclose your yard or other areas like playgrounds, empty lots, industrial areas, or sports fields. These fences are typically 3 to 12 feet in height and can be made even taller, which allows for them to be customized to the level of security you desire. Since they are see-through, people inside and outside the fencing can see to the other side, giving the fence another added security benefit. Chain link fences are durable and therefore require almost no maintenance. Since they are made of steel, they are immune to pests and will not rust, like iron fences. Another great benefit of chain link fencing is that they have a relatively low cost when compared to other fencing materials. You will not get the strength and visibility of a chain link fence at the low cost as you would with another type of fence. Chain link fences provide reliable security at the fraction of the price of other fences. In addition to being a cheap alternative to other fencing materials, chain link is very easy to install. An added bonus is that after you install the fence, you do not need to fret over painting or staining it as you would need to do with a fence that is made out of wood.